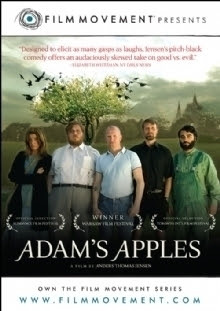 With the release of the international award winning Adam’s Apples, Danish writer/director Anders Thomas Jenson completed his “third and final” installment of as Variety’s Gunnar Rehlin wrote, his “excellent trilogy centered on oddballs and misfits in Denmark.” A critical and box office smash in its homeland, later picked up for stateside DVD releasing by Film Movement before appearing on the Sundance Channel, Jenson’s darkly comic religious parable takes its cues from the Book of Job in its story of an unusual reverend named Ivan (Mads Mikkelsen) who takes in ex-convicts at his small parish including the latest arrival, a Neo-Nazi named Adam (Ulrich Thomsen). Although they’re only required to stay for a few weeks, some of the convicts have remained possibly feeling at ease in the nonthreatening world inhabited by their off-the-wall mentor Ivan who wanders around in shorts, listening to the Bee Gee’s sing “How Deep is Your Love?” in his van, debating over whether or not he or his distraught parishioner should get the bigger cookie and in return, only requiring that the men listen to his sermons without trying to use the locked bathrooms and also that they set a goal while they are there. Possibly joking or perhaps figuring it to be a simple goal, Adam makes the decision that he will bake an apple cake and the men’s bond, as well as Ivan’s religious devotion is put to the test as a series of unfortunate events seems to befall the group at every turn and then, of course, there’s also the matter that whenever Ivan leaves Adam’s room or the bible he gave the convict falls to the floor, it opens to the Book of Job. Unique, strange, alternately fascinating and irritating, Jensen’s film compels with its pitch perfect cast, especially thanks to Mikkelsen who starred in other films co-scripted by Jensen such as Brothers, After the Wedding and Open Hearts for director Susan Bier. Although the film’s subpar translation and poor subtitles where grammar and spelling errors abound pull viewers out of the filmed world, it succeeds on the level of telling a good story, without preaching in a way that would make it less successful for those of us who aren’t especially religious.